"Who Else Wants Step by Step Instructions on Skunk Smell Removal?" Listen, you wouldn't be at this page unless someone, something, or your pet has encountered a skunk, so lets get right to the point because the skunk spray is bonding stronger to whatever's been sprayed every minute that passes. Before you jump in and start trying to get the skunk smell off of whatever's been sprayed, there are a few important things you need to know. This may seem hard to believe since water cleans most everything. Skunk musk (a skunk's spray) is an oil based liquid which means that water will not wash it off. In fact, water can actually lubricate the skunk spray causing it to smear and spread to new areas. Think of it this way, if you use oil based paint you cannot clean your paint brushes with water because the oil repels the water. The same is true with skunk spray and water. How Long Does Skunk Smell Last? One of the first things you think about when dealing with skunk smell removal is how long will it take for the skunk smell to go away. On it's own, skunk smell can go away within two weeks under ideal conditions. If the skunk smell is outside where there is plenty of sunlight, wind, and low humidity the skunk smell may go away within 10 days. If, on the other hand, the skunk sprayed an area that does not receive much sunlight, is enclosed, and has higher humidity (such as beneath a porch) it can take much longer for the odor to disappear. It is possible to remove skunk smell within a few minutes using the right methods. Some of the remedies on this site are actually able to remove skunk smell on contact. Keep in mind though that the longer the skunk smell sits on an object the more difficult it is to remove. All across the internet people recommend using tomato based products to remove skunk smell and they swear it works. However, it doesn't work. Whenever someone pours tomato juice/paste over the skunk smell, they will only be able to smell the tomatoes and not the skunk and they are convinced they solved the problem. But what they actually did is trick their sense of smell (olfactory fatigue). Tomato juice and skunk smell are both very strong odors and if you expose yourself to one strong odor for 10-15 minutes (such as skunk spray) and then expose yourself to a new strong odor (such as tomato juice), your overwhelmed sense of smell will not be able to recognize both odors at the same time and will only be able to smell the newest odor. In the past (several decades ago and before new FDA rules) tomato paste/sauce was manufactured differently and was made using a completely different recipe than it is today. Because of this, the tomato juice/sauce 30+ years ago would actually be able to remove some of the odor, but the recipes used today are not strong enough to do anything other than make a mess. What Should You Do If Your Pet Gets Sprayed by A Skunk? Finding out that your pet has just been skunked is a difficult situation to deal with. Because of this, here are the best steps to take to make the skunk smell removal process easier and much faster. Let's face the facts, your pet has just been sprayed by a skunk and he/she is doing everything possible to get the skunk smell out of their fur, so listening to you is not going to be high on their priority list. Besides this your pet may be walking funny, whining/crying, foaming at the mouth (animals will produce excess saliva if sprayed in the face to try to flush out the odor...this is not a sign of rabies unless your pet was bitten several days prior), rolling on the ground, and rubbing themselves against everything they see. Unless you want your house to smell like skunk (and it will) do not bring your pet inside. If you do, the chances are that your pet will start rubbing against the floor, furniture, and anything else to wipe the odor off their body. 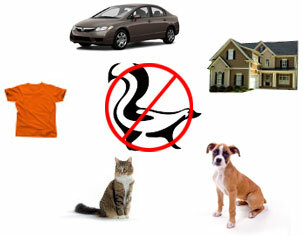 It is about ten times harder to get skunk smell out of a house than off of your pet, so keep your pet outside. Skunks can carry rabies so you will need to check your pet for any fresh bites or wounds that they could have received from the skunk. Fortunately, rabies cannot be spread via skunk spray, but it can be spread through saliva. So thoroughly check your pet for any injury they may have received during their skunk encounter. If you find anything that looks suspicious, contact your local vet as soon as possible to have them do a rabies test for your pet. If your outdoor furniture has been sprayed or any other outside property then this may be the best option. However, if anything else has been sprayed, then this is not recommended as it can take several weeks for the skunk odor to completely go away and wet/humid days can bring the odor back. This may sound like a good idea initially, but can end up being a mistake. Pet groomers have been known to charge quite a bit for skunk odor removal (they know you are desperate and willing to pay for the service). Plus, transporting your pet to the groomers can lead to the odor getting inside your vehicle. Most professional cleaning services are not properly trained to deal with skunk odor and will use conventional cleaning methods to get rid of the stench. Unfortunately, water is a major cleaning agent most services use and water can cause the skunk odor to spread. This is probably the option most people will use. Unfortunately it comes with it's drawbacks as well. Most people only deal with skunk odor once or twice in their life, and will tell everyone about it. Regrettably these people will often inaccurately share the recipe with others who need help. While most skunk odor recipes are similar they are very delicate to make and subtle changes can make the skunk odor solution useless or harmful to use. Get immediate access to all the top rated at-home remedies for skunk smell removal. These remedies are guaranteed to remove skunk odor from all sources and come with complete step-by-steps instructions on what to do so you can eliminate your skunk odor problems as soon as possible.